Google has had a busy 7 days on the social scene (what are they being fed?)! We’ve seen the launch of the Google+ project in addition to seeing +1 buttons appear in organic search results and next to AdWords ads (if you’re logged into your Google account). This is of huge significance to marketers as there will be countless debates about the +1 button’s impact on search rank and click through rates in addition to its persuasive effect a la social commerce. Google also announced that Google Analytics and Google Webmaster Tools have added new social monitoring tools tracking the impact of +1’s, Twitter tweets, Facebook likes and other social actions on your website traffic. 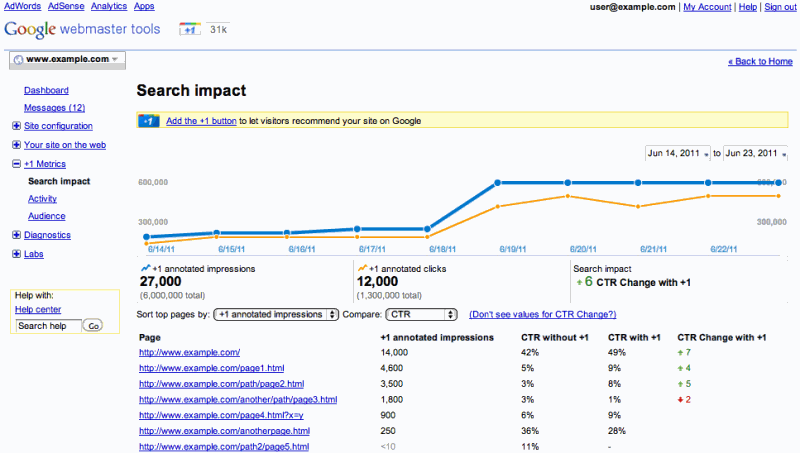 +1 Metrics in Google Webmaster Tools publishes the impact +1 buttons have had on your search performance. The search impact report illustrates the number of +1 annotated impressions by page in addition to CTR (click through rate) with and without +1 annotated impressions. +1 annotated impressions refer to the number of times a user saw a page in SERPS with a personalised annotation. 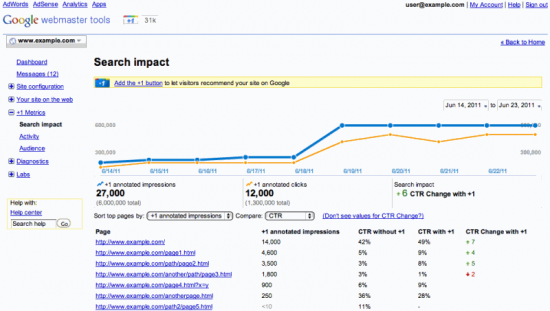 The metrics will quickly highlight the impact of social advocacy in search results. Google Webmaster Tools also publishes an Activity report indicating how many +1’s your individual web pages have received; and an Audience report illustrating demographic and geographic data about the people who have clicked on the +1 button on your web pages. As if that wasn’t enough excitement for one day, Google Analytics (the new interface) now publishes Social Engagement reports enabling marketers to see a plethora of social data such as how visitors shared your website content via social actions. This could include Google +1 button clicks, Twitter tweets, Facebook Likes and Del.icio.us bookmarks. 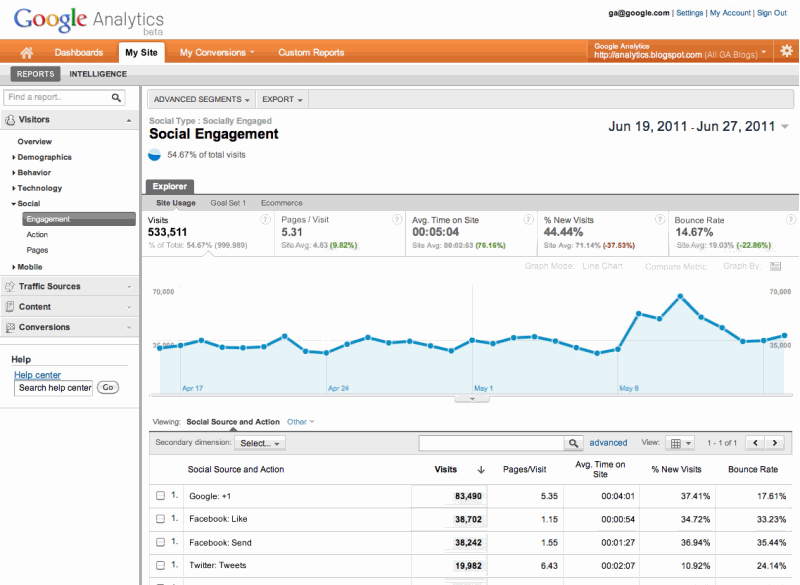 This is a welcome addition to Google Analytics and not surprising as Google seriously ramps up its social offerings. What an impactive change! I’m truly surprised this announcement is not getting more coverage. 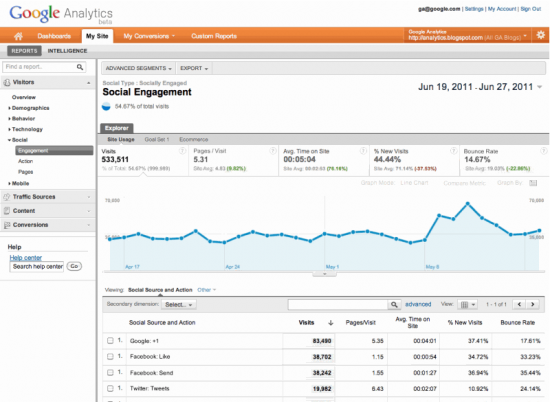 Not only does this allow for enhanced reporting and analytics of social media efforts (yay!) but it also offers extraordinary insight into how Google’s SEO algo responds with the social verticals. You hit the nail on the head there. Reading between the lines, if Google are offering social engagement reporting, it says a great deal about their search algorithm.